As you decide on the right disposable cleanroom suit for your controlled environment application, have you ever wondered about the fabric? What are the fabrics available for disposable cleanroom apparel? What are the Institute of Environmental Sciences and Technology (IEST) standards for fabric selection? How do you choose the right garment for your cleanroom needs? At Lakeland, we take pride in offering protective clothing to meet the needs of various industries worldwide. We are proud to bring this expertise and knowledge to cleanroom. 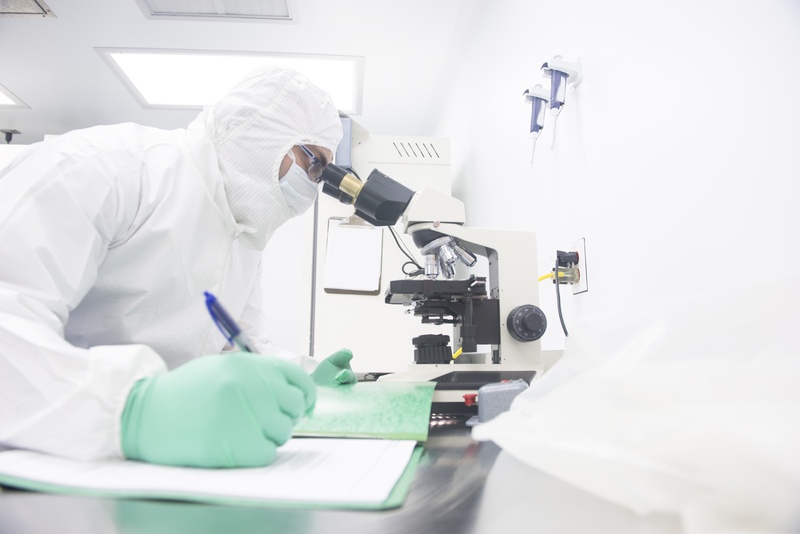 Let’s take a closer look at cleanroom suit fabric types. Your unique cleanroom requirements will dictate the type of fabric used in your apparel. For example, reusable cleanroom fabrics are manufactured using 100% continuous filament polyester and continuous filament polyester/carbon combination yarns to minimize particle shedding from the yarn. In contrast, disposable cleanroom apparel is constructed using a polyolefin fiber. Looking for a refresher on the IEST standards for Cleanroom Apparel? Lakeland has you covered. Download a free cleanroom apparel whitepaper now to learn more. A polyolefin is any long-chain synthetic polymer composed of at least 85% by weight of ethylene, propylene or other olefin units. A spun-bound or thermal bond fabric is created much like homemade pasta — a large clump is pressed through a grate. In the fabric construction process, the grated materials, or resin, is then melted and pushed through a spinneret to create string-like filaments. These filaments are then used to construct fabric, and ultimately, your cleanroom coverall, frock, or general apparel. Spun-bond/thermal bond fabric is typically made from polypropylene in a relatively open structure and is used in bouffants and shoe covers. These fabrics do not demonstrate high barrier performance such as high filtration efficiency or splash resistance and therefore have limited use in critical environments. However, spun-bond fabrics are made from continuous filaments, which increase strength and provide sufficient barrier properties for less critical environments. Flash-spun fabrics are a non-woven fabrics that are created from the fine fibrillation (the detachment of fibrils along the fabric surface) of a film by the rapid evaporation of solvent and the resulting bonding during the extrusion process. Flash-spun fabrics are made of high-density polyethylene continuous fibers and can be used for coveralls, sleeves and aprons. This fabric has barrier properties and is splash resistant to water. Interested in learning more about IEST standards for Cleanroom Apparel? Download a free Whitepaper now. Melt-blown fabrics are created when a polymer melt is extruded through small nozzles surrounded by high speed blowing gas. As a result, the randomly distributed fibers form a non-woven sheet product. Melt-blown fabrics are made from continuous polypropylene microfibers and is used in composite structures of many types of facemasks because of its high filtration efficiency and repellency. It does not have adequate strength to be used alone for garments. Spun-bonded / melt-blown / spun-bonded (SMS) fabric is a trilaminate non-woven fabric. SMS fabric is made up of a top layer of spun-bond polypropylene, a middle layer of melt-blown polypropylene, and a bottom layer of spun-bond polypropylene. This fabric is used in coveralls, frocks and hoods and provides barrier properties and comfort. Film laminate fabric is a two (or more) layer fabric that is constructed with a polymer film bonded to a fabric. This fabric demonstrates particle, blood and chemical barrier characteristics but lacks air and moisture permeability. IEST fabrics, selection criteria and seams, explained, in a free Cleanroom Apparel Whitepaper. Microporous film is a polypropylene membrane that is thermally laminated to a non-woven polypropylene fabric, resulting in a microporous fabric that has improved barrier properties and is splash resistant. This fabric is a good blood barrier and is used in surgical areas and other critical environments. Non-woven fabrics may be sterilized by a variety of techniques and may also be treated for antistatic properties. Cleanroom garments made of a spun-bonded polyolefin are not compatible with repeated ionizing radiation sterilization due to loss of physical properties and unacceptable fabric/garment degradation. Accumulated ionizing radiation sterilization at no greater than 50 kGy for disposable, single-use cleanroom garments is acceptable. Fabrics made of spun-bonded polyolefins may be stabilized during the fiber forming process to provide greater ionizing radiation sterilization compatibility. How Does Your Cleanroom Apparel Measure Up? As you select your next cleanroom suit, garment, or pierce of apparel, don’t forget to weigh each option against the recommended IEST evaluation standards. Cleanliness – The Helmke Tumble test is performed to determine the number of particles 0.3µm – 10.0µm emitted from the cleanroom garments. Cleanroom garments worn in classified cleanrooms must meet IEST Category I particle cleanliness which is less than 1200 particles 0.5µm and greater per minute. Electrostatic properties – The potential for a material or fabric to acquire and release an electrostatic charge is intrinsic to its physical composition and surface characteristics. An electrostatic charge can affect the product, process or environments by discharge, induction or both. Therefore, some fabrics are treated for antistatic properties. Durability – The durability of a fabric should include durability after the sterilization process selected over the recommended useful life of the cleanroom garment. Comfort – The Moisture Vapor Transmission Rate (MVTR) determination of a fabric provides comparative information of relative comfort of the fabric. Particle Filtration Efficiency – This is the ability of the fabric to filter particles generated by the wearer. Microbial penetration – This is the ability of the fabric to prevent microbial penetration and the passage of particle contamination. Fluid resistance – This is the ability of the fabric to repel water. Chemical resistance/compatibility – This is the ability of the fabric to repel chemicals. The fabric should be tested using the chemical to which it will be exposed. 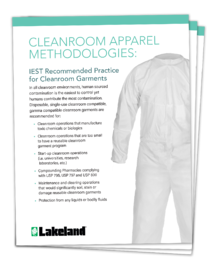 Learn more about IEST standards for Cleanroom Apparel in a free whitepaper, available for download now.